PHELAN, Calif. -- Officials announced this morning that 96 homes and 213 outbuildings have been destroyed in the Blue Cut Fire as the massive blaze continued to burn near the Cajon Pass. The fire is now 26 percent contained. Since the blaze ignited Tuesday, it has charred 37,000 acres. Firefighters made significant progress Thursday and overnight. "Crews really buttoned up some areas. But the possibility is still there for explosive growth," fire spokesman Brad Pitassi said. That concern was especially focused on an area southeast of the mountain town of Wrightwood where old- growth brush and trees haven't burned in 70 years, fire behavior analyst Brendan Ripley said. Some evacuated residents east of Interstate 15 were allowed back home on Thursday, including East Oak Hills, South Hesperia and the West Oak Hills area. However, about 34,500 homes remain under evacuation orders. The San Bernardino County Fire Department's crews say the blaze tore through like a tornado, and they could do little to stop its destructive path. Officials have been telling residents to prepare for the worst. "Imagine everything you own being taken from you, and you have absolutely no control. There's nothing you can do," said Lisa Gregory of Lytle Creek. The American Red Cross said it has 301 people registered between its Fontana and Hesperia evacuation shelters. But they have room to grow should the fire threaten more communities. About 1,580 firefighters from agencies throughout the region were on the scene, but plans were in the works to begin demobilizing some of the firefighters by the afternoon. Fourteen water-dropping helicopters are aiding the firefight, and additional air support was expected later in the day, according to the U.S. Forest Service. Gov. 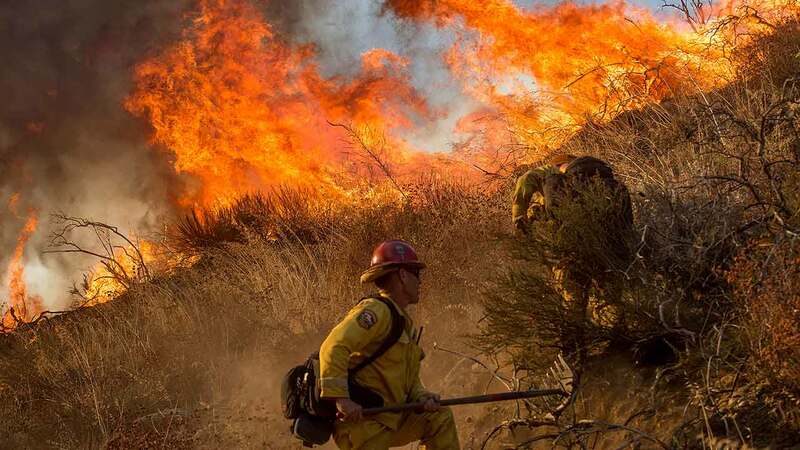 Jerry Brown has issued a state of emergency for San Bernardino County, which provides more state resources to firefighting efforts and grants certain benefits to affected residents. For full coverage of the Blue Cut Fire, click here.